13-Dec-2003 -- This is the first of a two-confluence hunt made in conjunction with a China Expat Soccer Tournament I was attending with our local soccer club known as the "Shambles - By name, by nature". It was the first of what will hopefully grow to be a quarterly event with some of the expat soccer clubs in China. Our opponents were a French team from Shanghai, a Beijing team of mostly Brits and Americans, and our hosts from Guangzhou, a mostly Australian team. Our team was the most international with players from China, France, Australia, New Zealand, Spain, Britain, and the U.S.
Chengdu, where I live, receives the least amount of sunshine in China as the result of being in a basin surrounded by high mountains. On the way to the airport there was very low-level cloud cover that would only have to drop about 50 metes to be pea soup fog. I was concerned that the flight would be delayed, but things went smoothly. Taking an early flight from Chengdu I got a window seat next to an elderly couple who are farmers. This was their first flight, as it was for quite a number of other passengers, and they marveled at the unfamiliarity of such things as seat belts. The man was next to me and had his eyes glued to the window, even while we sat on the tarmac. Take-off was a rush for them, and the food was strange. They decided that they would take some uneaten food home with them and put one plastic bowl in his hat. After the meal was over, the stewardess collected the trays and told them that they were missing a bowl. At first he denied it, but after the stewardess insisted, he sheepishly pulled it out of his hat and gave it to her. Once in the air, we quickly climbed through the clouds popping through like an arrow through a bed of cotton just as the sun was rising. There was a collective gasp at the beauty from the passengers. The clouds were painted with the deep orange glow of sunrise and the shadows cast by the low level of the sun highlight the fine formations of the upper level of the cloud cover. Once we got past the ridge of the basin the cloud cover evaporated and the landforms below became more distinct. Passing over mountainous Guangxi province, evidence of massive pollution from a multitude of cement factories could be seen. In one place, the factory smoke belched out a plume yellow-brown smoke several kilometers wide and scores long. Later we pasted over the pointy conical karst hills of Guilin, looking not unlike an irregular bed of nails. As we approach Guangzhou, vast areas of yellow raw soil appeared in areas of recent filling in preparation of new development. Closer to the airport warehouse and factory buildings covered the ground. From the airport I went to meet my teammates and play our first match. Afterwards, I had planned to meet Targ Parsons (China?s Confluence King with more than 80 to his name) at the train station. Targ had recently purchased a HK4,000 (US$550) alarm clock that also had useful other features such as a mobile phone and PDA to replace the one he lost on his last confluencing trip to China. As I was on my way to the train station, he called to suggest that we meet in Dongguan, along the way, so we can visit 23N 114E today, and then do 23N 113E on Sunday. Targ was waiting for me at the Dongguan train station when I arrived. He was standing in a cloud of paint fumes from a renovation going on at the exit gate and suggested that we walk to the confluence since it was less that two km away. It had been six months since we last met in Chongqing to do 29N 107E and 30N 106E. The city of Dongguan looks much like any other mid-sized city in China with the exception of the palm trees that line the streets. The main road along the railroad tracks led to the confluence and there was a billboard over the road announcing the Lakeside Villa development where the confluence lies. Targ said that on previous visits (this is his fourth time here) he always had difficulty getting into the development, so he suggested that we say we are interested in buying a unit. It seemed like a good strategy, and it worked like a charm. Once inside the development, we could have continued directly to the confluence, but we thought a quick stop in the sales office might be useful. The saleswoman, Wang Weihua, was very excited to see us and said that Unit 31 (next to the confluence) had been sold and was currently under construction. The new owners added 170 square meters to the basic plan making it a veritable mansion of 550 square meters (5,900 square feet). Ms. Wang said that the adjacent unit, however, was still available. Unit 31 sold for 3.800,000 RMB several months ago and will be ready for occupation in June 2004. 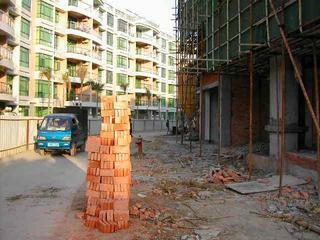 Average prices for new units are 7,800 RMB square meters in an unfinished condition. Decoration costs generally add 2-3,000 RMB per square meter. So getting a confluence unit in this exclusive development would set you back about US$700,000. It was not in the cards for me today. I was thinking about the price and wondering why there would be such a market for this kind of place 60 km from Guangzhou. Later I remembered that Dongguan is the center of clothes manufacturing in China, and obviously there is money in this business. There was an enormous 1:150 scale model of the development in the sales office that seemed to go on forever. Ms. Wang offered to take us around in a golf cart to check out the units. We told her that we would rather walk there so we could get a feel for the place. On the way, we past a fake rock wall with some calligraphy, magic music mushrooms, and a band of construction of new units. Unit 31 was lakeside with some swan boats lined along the shore. The monument and tree that Targ found on previous visits still remained. Targ also met one of the guards that stopped him on a previous visit a few years ago. Unit 31 was behind a construction fence and we entered the gate unchallenged. We quickly located the confluence point just outside what will be the front door located at a stack of bricks in what will probably be the front yard. After taking the required photos, we decided to explore the confluence unit, which at this point is only a basic shell, and roof. The construction workers had already quit for the day, so we had the huge place to ourselves. It is a three-story building with what looked like four-meter ceiling heights. On the third floor was a big deck area overlooking the lake. Given the late time of day, the setting sun afforded terrific views past the scaffolding. After we finished our tour, we jumped on the "Confluence Courtesy Bus" (sic) waiting outside for a free return trip to the train station. On our way back to Guangzhou, we got a new double decker train with high-tech seats with a complicated diagram and instructions printed on the back of the seat in front of us. Back in Guangzhou, we checked into the Yuexin Hotel where half the soccer team was located, and then went and had dinner with them. I christened this the Mansion Confluence. The story continues here at 23N 113E. #4: View to the West from the Confluence Point with the Confluence Courtesy Bus waiting for us. #6: Victory Photo taken from the CP - Peter and Targ standing in the front door of the confluence unit.